You can’t go anyplace in the States these days without running into the subject of politics. With a presidential election a mere two weeks away, it’s the hot topic on everyone’s lips. Sometimes it’s hard to remember that less than 100 years ago, a major segment of the American populace was not extended the privilege of the ballot. It wasn’t until the 19th Amendment was ratified in August 1920 that the adult female population of this country was legally empowered to step up to the polls beside its menfolk. That’s not to say that in the days before suffrage women didn’t have opinions about politics, or that they kept those opinions to themselves. Well before they were granted access to the voting booth, countless thoughtful, talented, and courageous women were utilizing fabric, needle, and thread to “cast” their votes, comment on the political landscape, and participate in national life by making quilts. Grover Cleveland Quilt, 1884 – 1890, 61″ x 75″, courtesy of the American Folk Art Museum, New York. This quilt appears in the current exhibit at the Boca Raton Museum of Art. That said, the Boca Raton Museum of Art (Boca Raton, FL) could not have chosen a more timely exhibit for current display. Politics NOT as Usual: Quilts with Something to Say, which opened at the Museum on September 11, 2012, features a collection of politically themed textile masterpieces on loan from the American Folk Art Museum in New York City. From quilts expressing Union pride following the Civil War, to those promoting presidential politics, oanger at being denied the right to vote, or a call for Hawaiian independence, Politics NOT as Usual offers a unique and personal context to our country’s past. 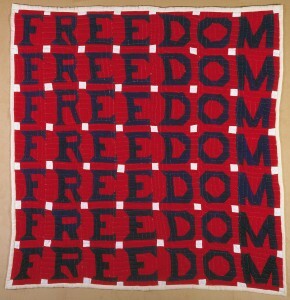 Freedom Quilt, 1983, 74″ x 68″, made by Jessie B. Telfair (1913 – 1986), Parrot, GA. Courtesy of the American Folk Art Museum, New York; gift of Judith Alexander in loving memory of her sister, Rebecca Alexander. This quilt appears in the current exhibit at the Boca Raton Museum of Art. 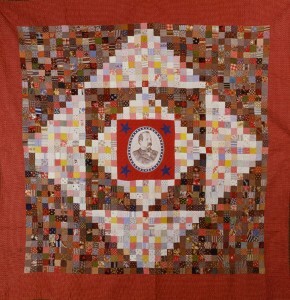 “These quilts are remarkable for many reasons, not the least of which is the political messages they convey, sometimes overtly, sometimes in not so obvious a fashion, and many at a time when women had no voice in the politics of this country,” states Claire Elisabeth Clum, Curator of Education at the Boca Museum. Perhaps the most highly anticipated quilt appearing in the Boca exhibit is the 9/11 National Tribute Quilt. This physically imposing (8 feet by 30 feet) and surprisingly intimate work incorporates quilt blocks from 500 people in all 50 states, as well as from Canada, Spain, Denmark, and Australia, made to acknowledge the loss of thousands of lives on that infamous day. The Boca Raton exhibition marks the first opportunity for viewers to see this historic quilt outside the Folk Art Museum in New York City. It is truly a stunning–and a extremely moving–sight. Steel Quilters 9/11 National Tribute Quilt, 2002, 8′ x 30′, courtesy of the American Folk Art Museum, New York; gift of the artists, Kathy S. Crawford, Amber Dailey, Jian X. Li, and Dorothy Simback, with the help of countless others in tribute to the victims of the September 11, 2001 attack on America. Politics NOT as Usual: Quilts with Something to Say will remain on view at the Boca Raton Museum of Art through January 13, 2013. 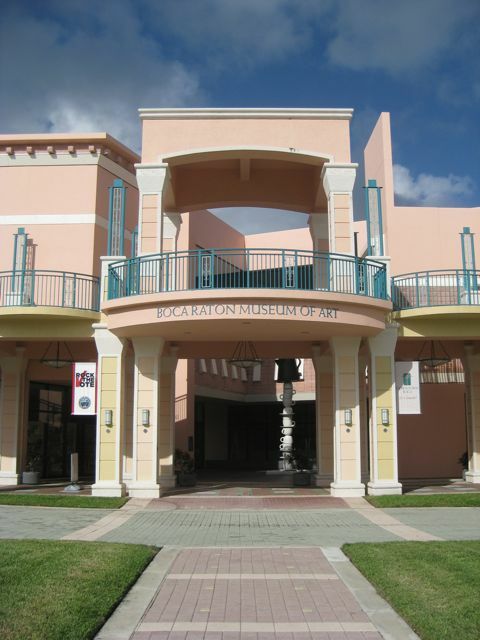 The Museum is located at 501 Plaza Real (in Mizner Park), Boca Raton. Visit the Museum website or call (561) 392- 2500 for additional information about the exhibit, hours of operation, admission fees, related programming, and other details. If you’d like to learn more about women and how they have used quilts to express their politics, social viewpoints, and other concerns, you need look no further than the documentary Why Quilts Matter: History, Art & Politics. The series dedicates an entire 26-minute episode–Episode 7: Empowering Women One Quilt at a Time–to this subject; just click here for a preview. Two of the quilts shown above (Grover Cleveland Quilt and Freedom Quilt) appear in this episode, and Stacy C. Hollander, senior curator and director of exhibitions at the American Folk Art Museum, appears in the series as well. You can purchase your own nine-episode, two-DVD set of Why Quilts Matter: History, Art & Politics by clicking here. 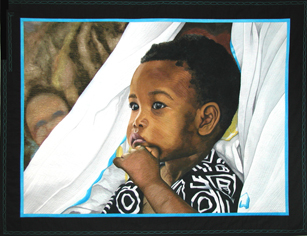 Fatima’s Son, 36″ x 46″, by Hollis Chatelain; photo by Lynn Ruck. This quilt appears in Why Quilts Matter, Episode 7: Empowering Women One Quilt at a Time. Many thanks to Claire Clum and Austin Modine at the Boca Raton Museum of Art for their assistance in preparing this post…and don’t forget to VOTE on Tuesday, November 6!